Securing funding is one of the most difficult, yet necessary steps for a startup. No matter how great the idea, proper funding is needed to get any business off the ground and into market. 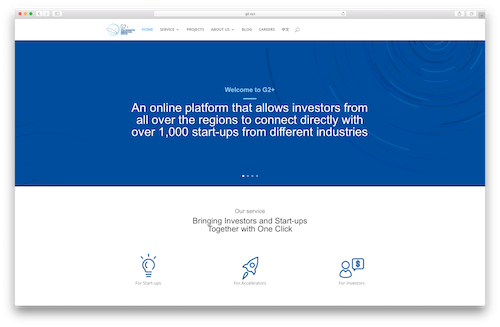 This week’s #WebsiteWednesday is a platform that helps startups raise capital by connecting investors and entrepreneurs from across the world – G2.xyz. G2.xyz is an online platform that connects Chinese investors with American startups. G2.xyz streamlines the entire funding process for startups, including incorporating a business, finding funding, and managing equity and profit shares. For investors, G2.xyz provides a list of over a thousand startups to explore, as well as their financial management and communication tools. G2.xyz’s portfolio includes 10 startups that have been fully funded through their platform. Additionally, they’ve gathered a pool of innovators consisting of over 300 PhDs and other post-doctorates from top ranking schools like Harvard, Yale, and MIT, to assist aspiring entrepreneurs getting their ideas off the ground. It was important that G2.xyz was able to secure a memorable 2 character domain on an internationally recognized extension, .xyz. G2 stands for a group of two, hinting at the relationship the company is building between American and Chinese investors. G2 is also colloquially known as “getting the lowdown” / gathering information, which is exactly what G2.xyz does for potential investors. Both .xyz and G2 are built to bring together an international community fostering innovation and looking for a better future. Their name was a great and instinctive choice for their business and we can’t wait to see which other startups will use their support in getting off the ground.